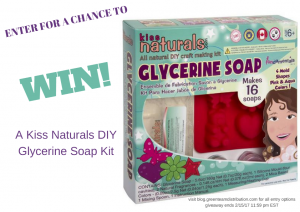 This entry was posted in Blog and tagged Giveaway, green team giveaways, kiss naturals, soap making kit. Bookmark the permalink. The best product that I have tried for my children is Burt’s Bees Lotion. I like Lemongrass Spa products. They don’t have any parabens, SLS, gluten, phthalates or sulfates. I use Eucerin lotion on my youngest daughter and it does wonders for her extremely dry skin. We love young living essential oils. Love to do things natural! I make a lot of natural skin products with essential oils; they’re great for the whole family. The best product that I have tried for my baby is natural baby products! Johnson’s No More Tears shampoo was a lifesaver when the kids where little. We like Johnson’s Baby Shampoo. We are still experimenting on what we like best with our one month old. I really like the Aveeno bath and shampoo wash. Makes smell great! Bag Balm! It’s the only thing we used for diaper rash and it worked great. I like using the Baby Mantra 3-in-1 Bubble Bath, Shampoo + Wash.
Zinc Oxide Paste is great for diaper rashes and most minor skin rashes. I use Tubby Todd body wash for my granddaughter. We like Burt Bee’s products. Thanks! We like Johnson and Johnson’s. I think the best product I have tried on my little one is Tom’s of Main natural toothpaste. It has paraben-free! Burt’s Bees Baby Bee Shampoo is best. I like the Tierra Mia Organics brand. I love to use the Shea Moisture for baby. Baby Mantra Newborn Shampoo and Body Wash is a good choice. A cool Babo Botanicals Smoothing Shampoo & Wash.
We always get the Aveeno Baby Wash & Shampoo.